NEVER let the weather get you down – at least not when I’m around in my new waterproof jacket, emitting neon rays of sunshine wherever I go! My wife and kids absolutely love this jacket. They can walk half a mile away from me, turn round, and still spot me within seconds. I am not sure the Belgians share their view. Unsuspecting tourists fell before me, blinded in agony and flailing desperately for their sunglasses. Security guards wondered why on earth Border Control had allowed such an article of clothing into the country. But we were in luck! It was 22 March 2014 – the day of the Cup Final at the nearby King Baudouin Stadium. One of the teams was Lokeren. They play in yellow and black! Like a bee in its hive, I was suddenly one of the crowd – and my team won! 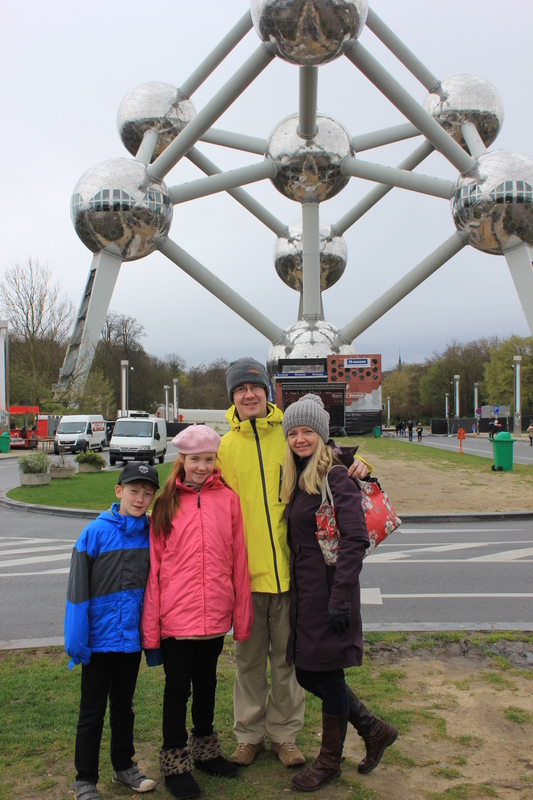 But we weren’t here for the stadium – we were here to see the Atomium. What an incredibly strange structure! 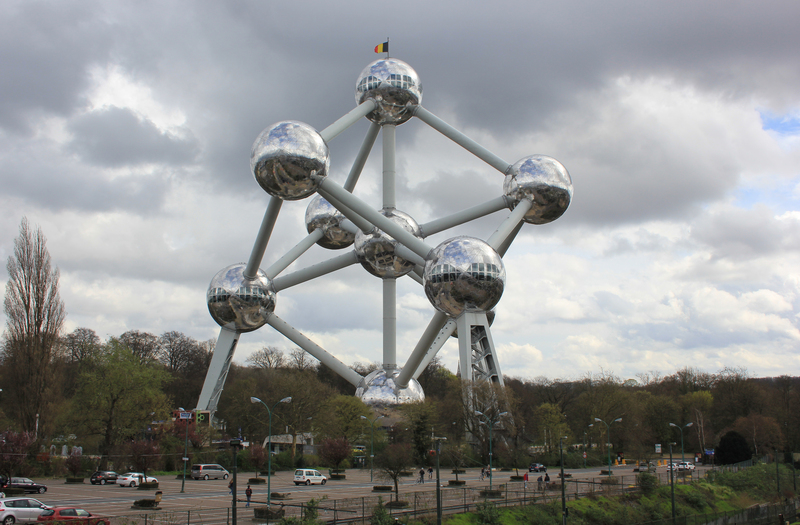 The Atomium was constructed for Expo ’58, the Worlds Fair. Standing at 102 metres tall, it is a replica of an iron crystal magnified 165 million times. Each of the nine spheres is 18 metres in diameter. The tubes connecting them house staircases or escalators. From the outside it is difficult to take your eyes off it – it really is quite spectacular! The spheres gleam even when the clouds do their best to dull the day. And when the clouds clear the spheres really come into their own! And so if the outside is this good, the inside must be spectacular! Right? Wrong! In fact where is everybody? The internal structure was impressive, I grant you. But the exhibits? Although I had read that the displays had a lot to live up to, nothing prepared me for what we found. 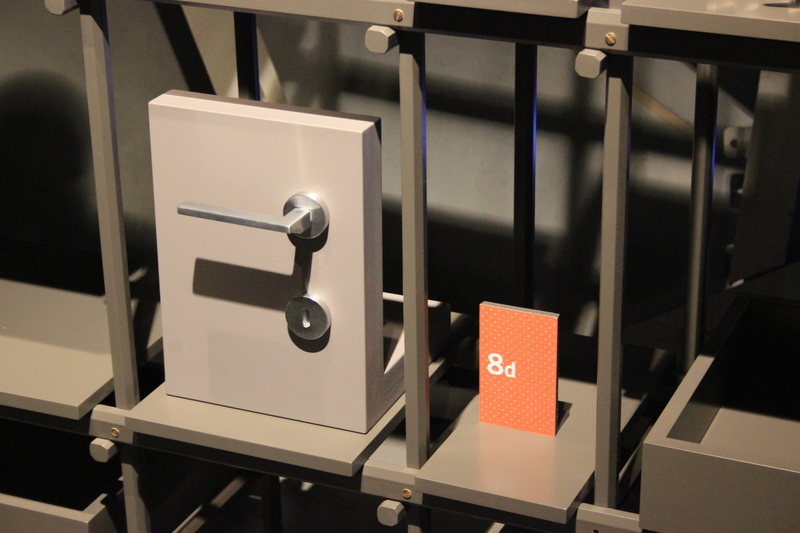 To illustrate: here is one of the exhibits. It is a brushed chrome door handle, designed in 2009. Poor old Vincent Van Duysen, for it was he who designed this. I am sure it is very capable door furniture. Apparently the rose comes square as well as round. Were I choosing a brushed chrome door handle this might be of importance to me, but I wasn’t here to choose door handles. 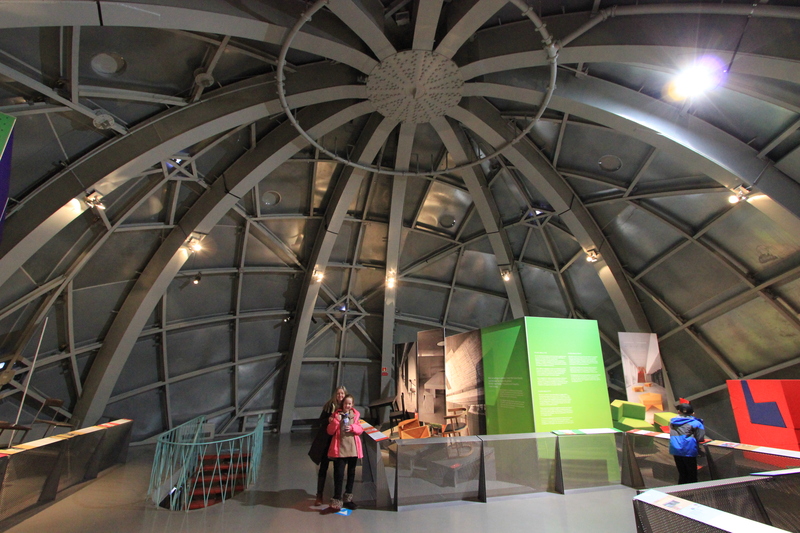 I was in the Atomium, a cutting-edge structure designed in 1958 that still has the ability to wow modern audiences. Can you name anything else from 1958 that still has the ability to do this? Well OK, NASA was formed in 1958. Oh, and the microchip was invented. So I accept there was lots of impressive stuff happening in 1958, but if that is the case, then why why WHY bring visitors down to Earth with such a bump with a display of door handles? Did I mention that much of the exhibition was dedicated to chairs? 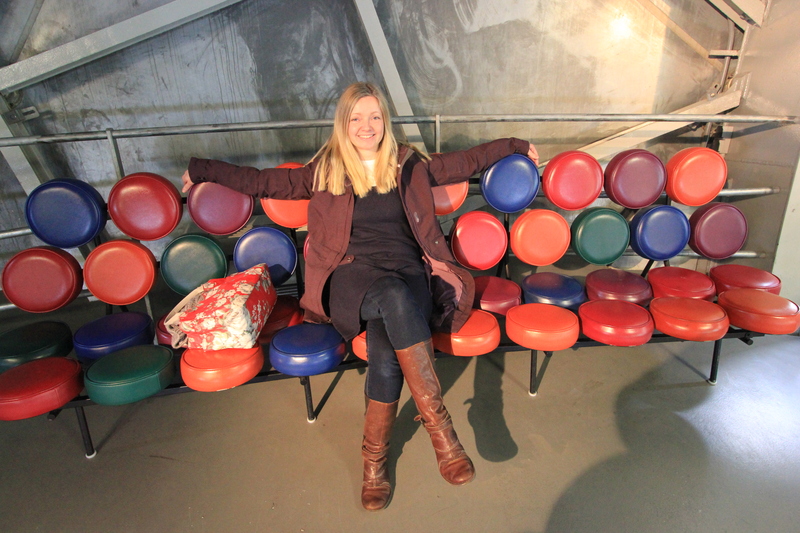 This was the best chair we found (it was more comfortable to look at than sit on). Poor old Deb – she’s trying her best to smile in this picture but you can tell she’s struggling to stay awake! Enough of these displays! 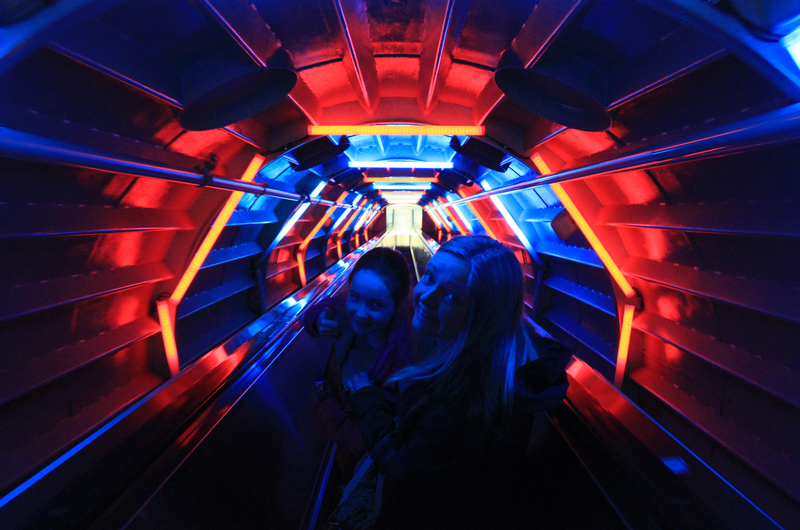 Let’s go up to the viewing deck in the top sphere! The only way up is by elevator (the fastest in the world when it was designed) so we had to go back down to the lobby. The escalator down was pretty fun! The viewing deck wasn’t bad at all. The spheres underneath us were impressive from this perspective. 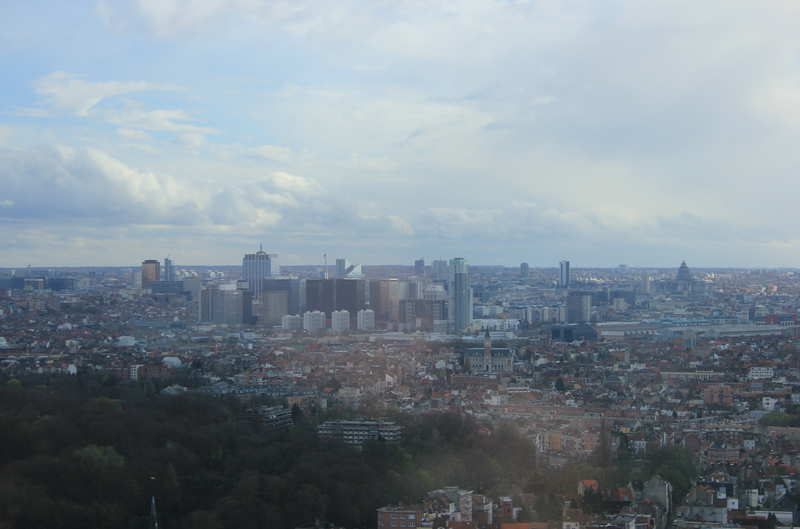 It was also good to get some views over Brussels. 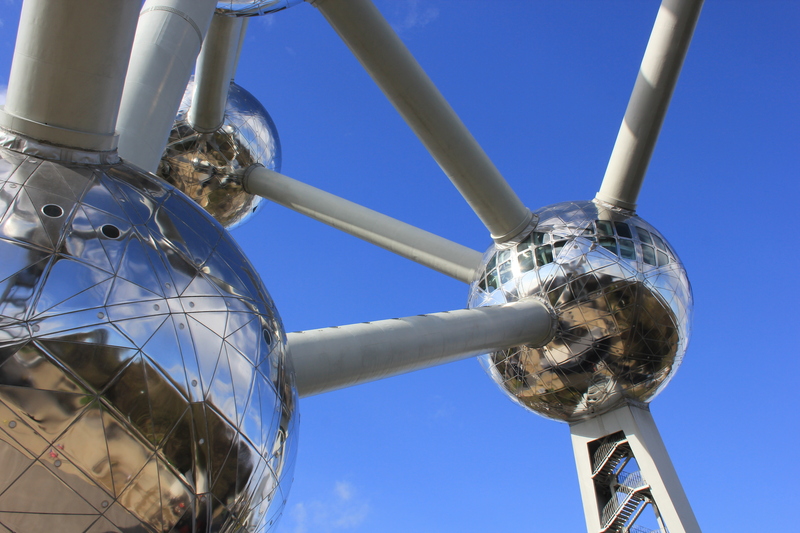 The Atomium is one of the iconic features of Brussels. It is an incredible sight and well worth visiting. People come in their thousands – 600,000 people a year! What a pity, therefore, that the inside displays are such a disappointment. 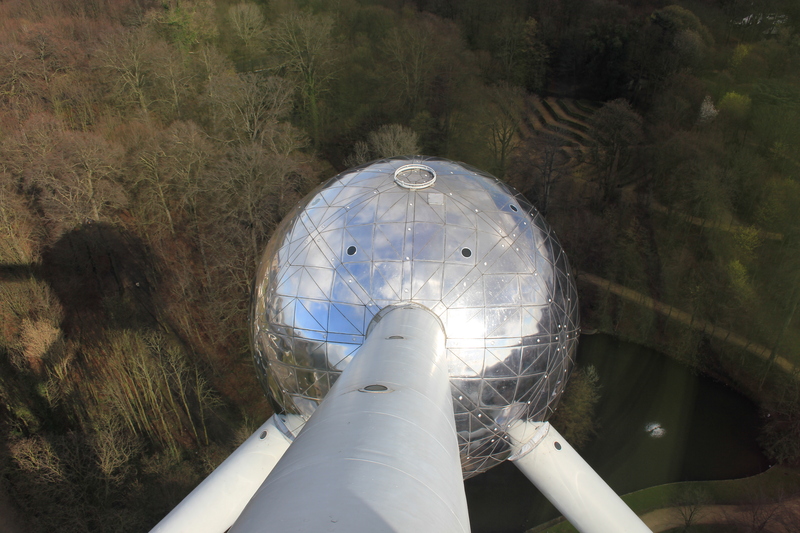 This entry was posted in Belgium and tagged architecture, Atomium, Brussels, sphere, travel. Bookmark the permalink. Great looking place. Looks like you were all having fun. Ha! I knew they looked like something but couldn’t work out what. Thanks RH! You are spot on!